There's good reason for Scott Satterfield and Louisville’s new staff to feel like things are looking up: That's the only place they can go after last year. Plus, Publix song rankings, fried pickles in Louisville and the rest of this week's Punt, Pass & Pork. LOUISVILLE, Ky. — When Scott Satterfield arrived at Louisville from Appalachian State in December, he combed through the roster to determine his recruiting needs. He saw that the Cardinals had eight returning offensive linemen on scholarship. “That’s not enough,” he says. He saw that the Cardinals had 15 returning wide receivers on scholarship. “That’s too many,” he says. Louisville had one returning tight end. That wouldn’t have seemed odd if the Cardinals hadn’t used a tight end much, but former coach Bobby Petrino’s offense used tight ends frequently. Satterfield won’t put it so bluntly, but it was almost as if the people who had stocked Louisville’s roster hadn’t planned to be there long enough to coach it. Now, as Cardinals players file into the transfer portal following a very early spring practice Satterfield embraced after Duke coach David Cutcliffe sold him on it, Satterfield can get down to the business of coaching the Louisville players who want to be part of a resurrection that will come with time. Reading the headlines about the players leaving the program might lead to the assumption that Louisville players are unhappy. That couldn’t be further from the truth for the bulk of the roster. Dennison was at Louisville for the fun times (on the field), when quarterback Lamar Jackson won a Heisman Trophy in 2016 and the Cardinals went toe-to-toe with a Clemson team that would go on to win the national title. Dennison joined Mario Cristobal’s staff at Oregon after the 2017 season, so he missed the free fall and subsequent rock bottom last season. But he had recruited many players on the roster, so his heart ached for the Cardinals as they endured blowout after blowout. The Cardinals lost their last nine games. They allowed at least 52 points in each of their last five. They were the worst team in the ACC, and it wasn’t particularly close. After native son Jeff Brohm chose to remain at Purdue, that task fell to Satterfield. It might wind up being better for all parties that it worked out this way. Brohm would have arrived with savior expectations and might not have been granted the time it will take to climb out of the hole Petrino dug. Satterfield, meanwhile, has done something like this before. No, he hasn’t taken over a program that flatlined. The culture at his alma mater Appalachian State was always healthy. But when Satterfield replaced his college coach and former boss Jerry Moore in 2013, the Mountaineers were transitioning from the FCS to the FBS. They were going from 63 available scholarships to 85. (Given Louisville’s recent portal entries, which don’t seem to have the coaching staff the least bit broken up, the numbers issue should feel quite familiar.) In Satterfield’s first season as head coach, proud Appalachian State went 4–8. The Mountaineers started his second season 1–5, but no one seemed panicked. Satterfield could feel the turn coming, and when it came, the momentum just built. “We went on the road back-to-back weeks and beat [Louisiana] and Arkansas State,” Satterfield says, referring to two of the better programs in the Sun Belt at the time. “I thought, ‘We’re going to be pretty good.’” And they were. The Mountaineers finished 2014 on a six-game winning streak. They then went 41–11 over the next four seasons. Satterfield knows he’ll have to start with a rebuild at Louisville. He doesn’t care about what happened in the games last season, but with a spring practice under his belt, he has a good handle on the roster. He has quite a few players who belong as starters in the ACC. He also knows he has some that don’t. He’ll have to develop those while recruiting players capable of winning in a division led by the current college football Death Star (Clemson) and populated with former also-rans (Syracuse, Boston College, Wake Forest) that have improved dramatically in recent seasons. There’s also the matter of Florida State. The jury remains out on the Seminoles, but if they get their issues straightened out, Satterfield’s job only gets more difficult. But it’s not a difficulty he can’t handle. His recruiting classes at Appalachian State usually ranked from the middle to the bottom of the Sun Belt. You saw the record, so who knew better: his staff or the recruiting services? At Appalachian State, Satterfield sought players who could run like their ACC and SEC counterparts at their positions. They might have been four inches shorter or 30 pounds lighter, but the Mountaineers never sacrificed speed. The Cardinals won’t, either. The difference is that now the players who fit those ACC archetypes will be willing to hear Satterfield’s pitch. Yes, Louisville had a horrible season last year. But the Cardinals also had a player hoist the Heisman less than three years ago. That will resonate with recruits. Don’t be surprised if Satterfield’s first recruiting classes remain below the midline in the rankings. He knows he eventually needs to beat the Clemsons and the Georgias for a player or two if he hopes to win an ACC title, but he’ll build this program the same way he built Appalachian State—with tough, smart players who love competition. He knows this works. Unlike his predecessor, he won’t tilt everything toward the offense. “He understands the dynamics of letting the defensive coaches take control and manage their side of the ball,” Dennison says. Satterfield is the rare head coach who comes from the offensive side of the ball and embraces offensive innovation but also understands he must give his defensive coaches the resources and the practice time they need to build a dominant unit. Satterfield learned that the hard way in 2004 as an Appalachian State assistant. The Mountaineers had switched from the I-formation to the spread, and Satterfield called the plays. Appalachian State’s scoring average rose dramatically, but so did the amount of points the Mountaineers allowed. A 59–56 loss late that season at Chattanooga convinced Satterfield that if he ever ran his own team, he wouldn’t sacrifice defense for offense. In three of the past four seasons, Appalachian State ranked in the top 20 in fewest yards per play allowed. Last year, with current Louisville coordinator Bryan Brown in his first year running the defense, Appalachian State ranked fourth in the nation, allowing only 4.4 yards a play. The Cardinals may have some growing pains as the staff retools the roster, but they can rest assured that it can’t get worse than last season. Louisville has nowhere to go but up, and the Cardinals seem to have found a coaching staff that understands exactly how to do the lifting. My local grocery chain has very specific musical tastes. I imagine the tunes that are scientifically selected to make us buy more Doritos vary little from chain to chain, so the H.E.B playlist and the Ralph’s playlist and the Wegman’s playlist probably aren’t that different. But I have the most experience with Publix, so today I give you the 10 Most Publix Songs. 1. United Airlines offered on Friday to back out of a $69 million deal to slap the company’s name on the Los Angeles Memorial Coliseum, continuing a string of weird USC news that seems to stretch back for months. Arash Markazi of the Los Angeles Times—and formerly of SI.com—made an excellent suggestion. If everyone feels putting a company’s name on the stadium would cheapen the memorial the stadium is intended to be, then it should include an actual memorial to the soldiers and veterans it is supposed to memorialize. 2. I surveyed current and former NFL scouts to find out which schools are their favorite—and least favorite—to visit. Spoiler alert: If your school isn’t wide open to the NFL, your coach’s paranoia is only hurting recruiting. 3. SI’s Joan Niesen broke down the quarterback competitions that will rage this spring and beyond. Why do we care so much about sports? This is why. I’m just grateful I got to be there to see it. If your menu makes a bold claim, you’d better be prepared for your food to back up that bravado. Simply describing the food doesn’t raise expectations so high that they’ll produce anger when they come crashing down, but if you call your wings the “BEST WINGS EVER”—even if your tongue was planted firmly in cheek as you typed up the menu, then those wings had better be good. Fortunately for Momma’s Mustard, Pickles & BBQ in Louisville, the wings are tremendous. Are they the best ever? Probably not. Are they big, juicy and covered in a salty, sweet, savory rub? Absolutely. Does the process of smoking and then flash-frying make for a holy duo of smoke flavor and crispy skin? Yes it does. They might not be the best in the world, but they’re probably the best in their corner of the world. And that’s good enough. Besides, Momma’s may actually have something on the menu that is the best on the planet in its category. The fried pickle is pretty much the perfect appetizer. The salty batter over the bracing, briny pickle seems scientifically designed to make diners crave more food and more beer. This dish remained a Gulf Coast hidden gem for decades before going nationwide around the turn of the century. 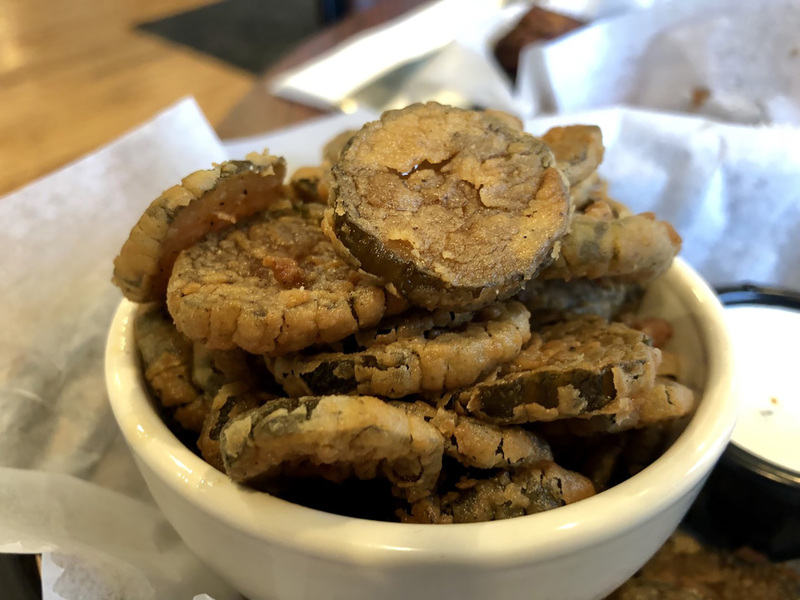 Now, you can get fried pickles just about anywhere—and they’re almost always good because the constituent parts dictate that they must be good. But you’ve probably never eaten fried pickles like the mucho macho fried hot pickles at Momma’s. There’s nothing particularly macho about them. They are slightly spicy, but that’s not what makes them special. What makes them so interesting is that they are spicy bread and butter pickles. Bread and butter pickles are the sweet cousin of the dill, and I usually hate them. But when combined with a hint of spice, battered and fried, they become the ultimate appetizer. In fact, the only potential drawback to these particular fried pickles is that you’ll just want to order three more bowls of them instead of a main course. Momma’s has a pretty standard barbecue menu, but just skip it. They use babybacks for their pork ribs, and frequent readers of this space know babybacks are a high degree of difficulty meat that should be avoided in favor of spare ribs. 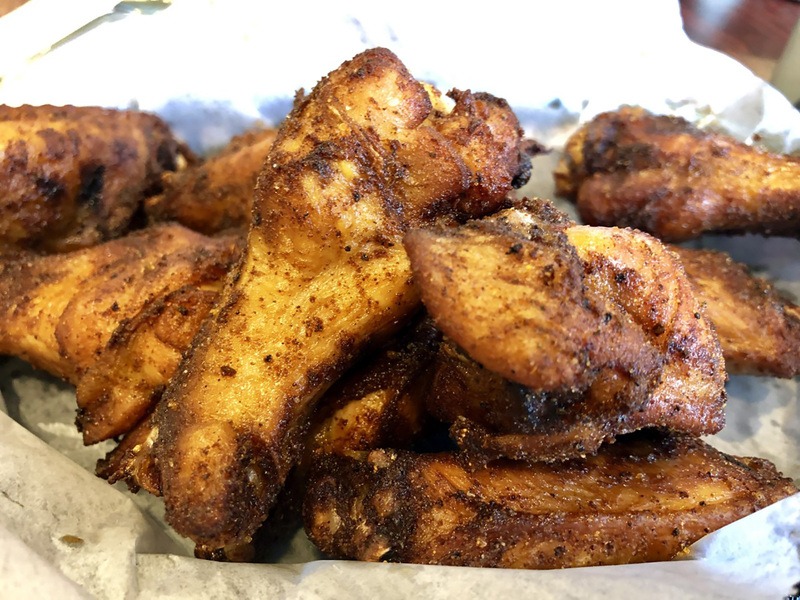 Their beef ribs aren’t cooked with the kind of care that produces the rib I wrote about last week at the Bearded Pig in Jacksonville, Fla. They’re a little too tough, and at Momma’s, there is no need to spend money on meat that doesn’t come in wing form. Those wings may not quite live up to the lofty billing, but they’re excellent. The only issue is that you might fill up on those fried spicy/sweet pickles—which should be touted as the best in the universe—before you can eat wing No. 1.